If you love coloring as much as I do, then you’re going to adore these new coloring books. If you worship animals like I do, then you’re going to enjoy them that much more. These coloring books are “PURRfect” for the “HOWLidays.” Pour some cocoa, grab your kids and coloring tools, and get into the spirit of the season! My youngest son and I are addicted to coloring. Now that the weather is changing, we’ll be spending more time indoors. For us, that means coloring. I recently got us two new books to color, and my son went ballistic! He is a self-proclaimed “cat man,” and he happens to love his canine sisters more than us. So these books were “purrfect” for both of us. Illustrator Kayomi Harai has stolen our hearts with these furry feline friends in this new coloring book. 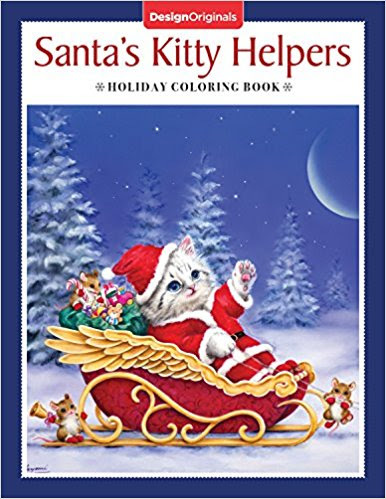 The book includes dozens of yuletide kitties that you can color in with crayons, markers, colored pencils and more. Each page is perforated so they tear out easily for display on your fridge or office walls. Liam likes to frame his favorites, and he hangs them all over his room. If you are a cat person, and are as enamored as we are with these four-legged fur balls, then you’re going to love Santa’s Kitty Helpers Holiday Coloring Book. Each page is more adorable than the next, and I have a hard time deciding which to color first! Don’t let the holidays stress you out. Coloring has been proven to ease stress and relax you. I know firsthand how therapeutic it is for the soul. 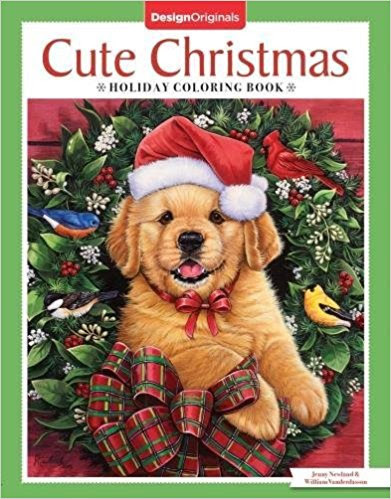 My son and I just added the Cute Christmas Holiday Coloring Book to our collection. It’s chock full of sweet pets in festive settings. This book features puppies, kittens, birds, squirrels, and more. Jenny Newland and William Vanderdasson did an amazing job. Grab your coloring tools, and make some time to relax! Both books are from Fox Chapel Publishing’s Design Originals, and are available on Amazon. (Just click on their titles and the link will take you there.